Twitter is a social networking site, similar to Facebook but with increased brevity. On Twitter, you write short spurts of text that express your thoughts or observations, or you share links. Or, you can just use Twitter to follow the thoughts and twitterings, or tweets, of other people. A message posted on Twitter is a tweet. A tweet can be no more than 140 characters long. That number includes spaces and punctuation. You can post messages on Twitter and follow others who post messages. It’s a good way to get updates and information quickly, not only from individuals but also from news outlets and other organizations. The best way to use Twitter on your Android phone is to already have a Twitter account. Follow the directions on the website for creating a new account. After you’ve established a Twitter account, you can use the Twitter app on your phone. Not all Android phones come with Twitter preinstalled. If you don’t find the app in the apps drawer, you can obtain the Twitter app from the Google Play Store. Search for the Twitter app from Twitter, Inc. When you start the Twitter app for the first time, touch the Sign In button. Type your Twitter username or e-mail address and then type your Twitter password. After that, you can use Twitter without having to log in again — until you turn off the phone or exit the Twitter app. The Twitter app’s main screen shows the current tweet feed. 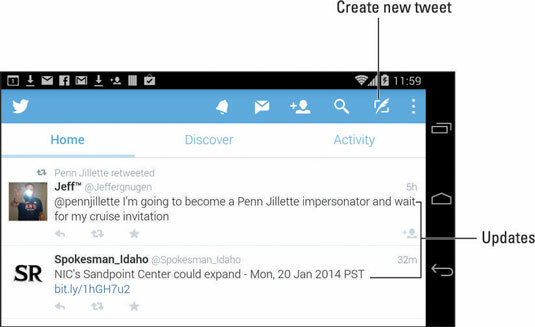 The main screen may look subtly different on your phone, depending on the Twitter app version. The Twitter app comes with companion widgets you can affix to the Home screen. 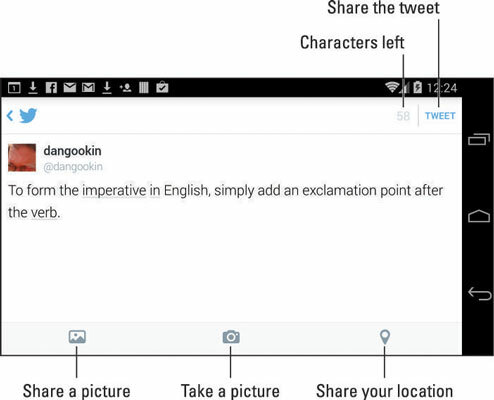 Use the widgets to peruse recent tweets or compose a new tweet. The Twitter app provides an excellent interface to the many wonderful and interesting things that Twitter does. Of course, the two most basic tasks are reading and writing tweets. To read tweets, choose the Home category. Recent tweets are displayed in a list, with the most recent information at the top. Scroll the list by swiping it with your finger. To tweet, touch the Create New Tweet icon. The new tweet screen appears so you can compose your tweet. Touch the Tweet button to share your thoughts with the Twitterverse. You have only 140 characters for creating your tweet. That count includes spaces. The character counter in the Twitter app lets you know how close you’re getting to the 140-character limit. Twitter itself doesn’t display pictures, other than your account picture. When you send a picture to Twitter, you use an image-hosting service and then share the link, or URL, to the image. All that complexity is handled by the Twitter app. The Twitter app appears on various Share menus in other apps. You use those Share menus to send to Twitter whatever you’re looking at.